Dragon Eyewear was built on a passion for action, encompassed by founder Will Howard’s love for surfing, snowboarding and riding dirt bikes. Through his enthusiasm and knowledge of the active youth lifestyle market, Dragon Eyewear was born in 1993 into a full line of eyewear, sunglasses, snow goggles and moto goggles. 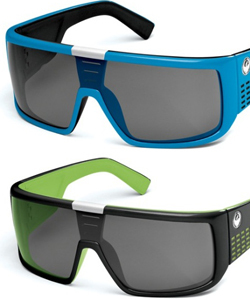 From its’ inception Dragon has been committed to being the leading eyewear brand for athletes and the active youth market, creating innovative, functional and high-quality eyewear based on market-leading creative design developments and unique styling. Athlete-inspired design and feedback is a basis in creating new products with a mission to create top-tier products with athletes in mind. Dragon eyewear identifies as a company that produces premium products designed with team riders inspired by art, music, fashion and alternative culture. Visit the Dragon Alliance Eyewear website.